Eventually, within months, the investigation of my son’s strange disappearance grew cold. There were no new leads. Even with the unknown phone number we had, it was impossible to trace it back to someone. The call was made on a prepaid phone, those you buy at Walmart or Best Buy. It’s completely untraceable. Anyone can purchase the small cellular device and activate it at home. The only hope I held onto was being able to determine where exactly the cell phone was purchased. Perhaps, like that the detectives can look through CCTV footage and identify who might have bought the phone. But then again, it’s like finding a needle in a haystack. Besides, locating the person who made the call to Grayson on the night he was last seen; doesn’t guarantee answers. Soon thereafter, rumors began spreading, and of course, I caught wind of it. My husband suggested to hire a private investigator to keep this case active. After all, people move on and forget. Private investigator Pete Sanders is a retired Law Enforcement detective and he treated our son’s disappearance with due diligence. He began re-interviewing neighbors, and friends and pretty much anyone on Grayson’s campus. Including professors, custodians just about anyone who ever had so much as a handshake with Grayson. We learned new information about Grayson’s life with each interview. Some of the testimonies were questionable, others I am not so sure. One of Grayson’s closest friends; Jerome and his girlfriend Ashley; told William and I that Grayson was having stress-related issues with classes. Jerome says that according to Grayson; he fantasized with leaving it all behind and running away to Mexico. Somewhere where nobody knew him. Perhaps, a place where he felt he had room to make mistakes and not be the perfect son his parents expected him to be. Now, I cannot say with certainty that I believe this story that Jerome and Ashley have told me, however, if it were true that meant Grayson pursued his wish and had simply ran away. And that meant he is safe somewhere. But on the other hand, how can my son have felt this way? To feel as if his father and I expected him to be perfect which isn’t the case at all. Both Grayson and his younger brother Daniel, were raised to pursue whatever they wanted, whatever made them happy, just as long as they did it well. Another new development came from one of Grayson’s neighbors, he failed to tell this to the police saying that at the time he didn’t make much of it, but he informed Private Detective Sanders that he might have seen someone going into the building in the middle of the night wearing a hooded gray sweater. But he was unable to identify the gender of this mysterious hooded-sweater-wearing person. And he also couldn’t determine if perhaps, it was someone who lived within the complex. I set up a $5,000 reward to anyone with information regarding my son’s disappearance. But every possible lead we received just wasn’t good enough to crack this investigation. What did happen to Grayson? And will we ever know? Two years after Grayson Barnes was reported missing, skeletal remains were found partially buried in a wooded area just twelve miles South from Grayson’s apartment. Upon further DNA examination; it was determined to be the body of would-have been twenty-three-year-old College student Grayson Barnes. The autopsy revealed Grayson was killed by blunt force trauma to the head. His skull had multiple fractures possibly made by a sharp object. To this day the murder weapon has not been found, and nobody has been held accountable for Grayson Barnes’ death. How Grayson disappeared and wound up murdered in a wooded area; remains unknown. What a twist, Lis! I'm convinced the answers are just as captivating as this mystery! We want more!! Thank you so much, Adam :) Part 3 will be a new development coming soon! A clever piece, my dear! Just as compelling and gripping as the first volume! I like how you've revealed the end result, but the mystery lives on. New details and new insight into both Grayson and the events of that night shift the picture, but give no clear answers; only create more questions. Bravo on such a spectacular job! You have an incredible gift for writing murder mysteries! This story was well worth waiting an extra day! You've shaped these volumes up real nice. Congratulations on such amazing stories! Why, thank you, Jeff! :) I've created quite the challenge for myself. But I will be back, this time with the solving of his murder. 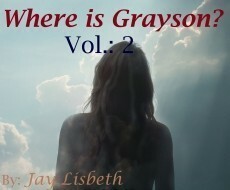 NOT a happy ending for Grayson, but excellent continuation, J. B! So now its definitely a murder investigation. Look forward to the conclusion, JB. Well done! Who indeed! Can't wait for the next part, jaylisbeth. Poor Grayson. The plot thickens. A part of me hoped he escaped his stress in Mexico. The other part, however, knew that would make for a terrible murder mystery lol Another intriguing chapter, mi gal pal. Who killed Grayson Barnes and why? That is the next story :) Thanks, Mel! I really appreciate the read! Nice mystery you’ve woven here. Keeps us captivated and wanting more. Remember those serials we used to watch long ago. ''Next week find out what happened to............. the suspense is too much. Nice writing. Come on! Let's have it. Way to pull the rug from under the reader! Spectacular job here girl! Your story hooked me from the first sentence. It was well written and the pace kept me a bit on edge. Now that the remains have been found, I look forward to this mystery unfolding. Poor Grayson. I was honestly hoping he would be found alive and well. Now I am really curious to see what happened! Thank you so much for reading, Criss :) I am in the works for the 3rd installment. Thank you, Tom :) I am actually working on part 3. I was about to say, giiirl, I’ve been watching enough Forensic Files to know that phone can be traced back! Lol. And the cause of death was also very Forensic Files of you. Anything you want to tell me? Haha! Good follow up! Wondering what kind of twist you have for the murderer. Give it up!